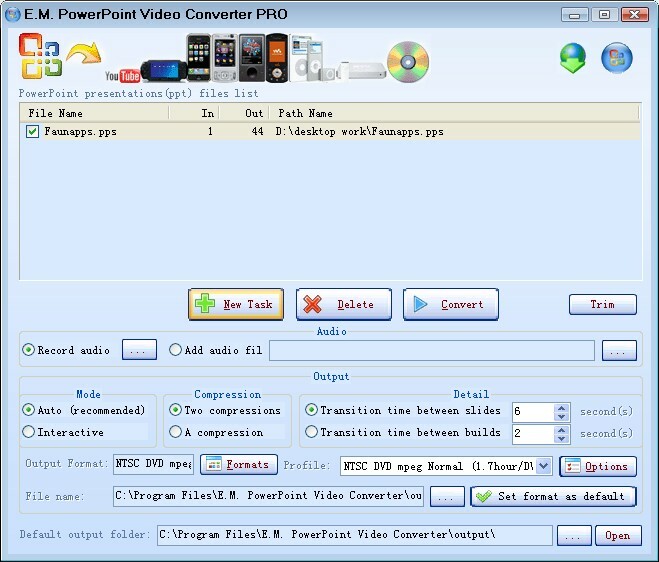 E.M. PowerPoint Video Converter is an all-in-one PowerPoint to video converter. It can convert PowerPoint presentations to almost all popular video formats such as AVI, MPEG, MPEG2 TS, MP4, WMV, 3GP, GIF, FLV, SWF, H.264/MPEG-4 AVC, Video, MOV, Youtube FLV with excellent quality. you could easily convert PowerPoint presentations to play on your media,It can convert PowerPoint to HD Video, and it has "converting + burning" one-step solution. ...... WMV HD, MKV HD, MP4 HD, FLV HD, XviD HD, DivX HD, MOV HD, meanwhile, E.M. PowerPoint Video Converter can help you convert, author and burn your PowerPoint to Blu-ray disc, AVCHD disc.
. Built a PowerPoint to video command line version, very easy to help you build a platform for the PowerPoint video conversion.
. Support PowerPoint 2000 2002 2003 2007. Qweas is providing links to E.M. Free PowerPoint Video Converter 3.20 as a courtesy, and makes no representations regarding E.M. Free PowerPoint Video Converter or any other applications or any information related thereto. Any questions, complaints or claims regarding this application E.M. Free PowerPoint Video Converter 3.20 must be directed to the appropriate software vendor. You may click the publisher link of E.M. Free PowerPoint Video Converter on the top of this page to get more details about the vendor.